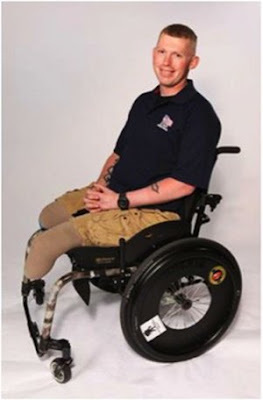 This article was published today at 3:02 a.m.
FAYETTEVILLE -- Marshall Kennedy, a Marine who lost his legs when a bomb exploded beneath him six years ago in Afghanistan, cringes when he says the word "hero." Marshall Kennedy lost his legs when a bomb exploded six years ago in Afghanistan. But on Wednesday afternoon, he's having to say that word over and over again inside a Fayetteville coffee shop. He's explaining the Human Exploitation Rescue Operative Child-Rescue Corps program, H.E.R.O. for short, of which he became a part after leaving the Marines. Each time, he pauses and squirms in his seat. "I didn't do anything special," he said, explaining his aversion to the word when talking about himself. "I just did my job. That was it." Kennedy, 32, of Farmington will receive a hero's welcome at War Memorial Stadium in Little Rock on Saturday when the Military Order of the Purple Heart, a service organization for combat-wounded veterans, plans to give him a specially equipped Ford Raptor truck.